We rarely stay in hotels and instead opt for self-catering cottages or B&B’s. However, we picked the Glengarriff Park because it was located perfectly in between the Beara and Mizen peninsulas, and because Glengarriff looked like a cute, small town. We were happy with both the town and the hotel. The hotel staff was extremely friendly; the rooms were comfortable and spotless. Each room also has a tea service. Glengarriff was a great town to base ourselves in. We treated ourselves one morning to a room-service breakfast which was a very nice treat. There is plenty of street parking here, but the hotel also has a parking lot in the back. Next to the hotel is a pub and a bistro owned by the hotel, apparently they share a menu. On the other side of the hotel is a very nice, very large shop with wool items from all over Ireland. We got a quick lunch and a pint at this pub at the top of Main Street in charming Schull town. It was filled with locals, and stocked with local food as well. We had a great seafood chowder (whenever you’re near the coast in Ireland, always ask for their seafood chowder!) and a plate of deep-fried Gubbeen cheese with raspberry jam, served with typical Irish soda bread, baked fresh in-house. The seafood was caught that morning, and Gubbeen dairy farm is just a mile outside of Schull; so it doesn’t get any more local and fresh than this. Off the R597 highway, west of the cute town of Rosscarbery, Drombeg is one of the larger and more intact stone circles in the region, dating to around 1000 B.C. Locally known as the Druid’s Altar, the circle has a common configuration: seventeen stones, including two large portal stones and one “recumbent” stone that may have been an altar or platform. It is thought that recumbent stone circles like this are aligned with various astronomical seasonal events; this one seems to line up with sunset on the winter solstice. A few steps away from the circle are the remains of a settlement from roughly the same time period, including what may have been a cooking space and a sort of living quarters. Drombeg is well-marked, with easy parking, free access, and an easy path to the circle; it is therefore heavily visited. We therefore recommend visiting it first thing in the morning, before buses start to arrive. The day we visited we were there completely alone (at 9:30am on a Sunday in June), but as we walked out we passed an entire busload of tourists that had just unloaded. Right next to the Crookhaven Inn is this tiny shop where Jorg both makes and sells handmade jewelry, as well as selling ceramic art from other local artists. This is a nice place to browse — no high pressure sales tactics here. The owners were very friendly and accommodating, and their goods themselves are beautiful. Items here are a bit pricey but that’s a good thing: they’re handmade using precious jewels and/or gold, and are of the highest quality. Jorg’s studio is right in the shop so you can watch him creating these treasures. We love staying at lighthouses in Ireland and England. The cliffside locations are impossible to beat, and we love the solitude, the whipping winds, the crashing waves. Loop Head is in a particularly stunning location, at the tip of Loop Head Peninsula. This lighthouse is open to visits from the public, and during the high season it can be very, very crowded out here during the day. We were there for a few days in the off season (March) and we saw less than 10 people in five days.–we actually saw more rabbits than people. There is a lighthouse keeper who lives on site. The cabin for rent is has two floors, a couple of bedrooms, a living room, and a sit-in kitchen. The kitchen is fully equipped, but it’s not set up to cook anything very complicated. The nearest store is in Kilbaha, a few miles away, and it’s just a tiny little store with a very few items. You need to bring all your own groceries, and it’s a good idea to bring paper towels, a roll or two of toilet paper (better safe than sorry), aluminum foil, etc. There are some games, puzzles and books in the living room. We stocked up on local cheese, sausages, eggs, veg, tea, milk, scones, jam, hard cider, and fixings for Irish coffees and had a fantastic time reading, hiking, dolphin watching, and jigsaw puzzling during the time we were there. Standing at the front gate with the lighthouse at your back, take an immediate left and follow the path to the cliffside. At the end of the path, on the cliff’s edge, there is a loveseat-size indentation in the grass. We found this a perfect, if somewhat scary, place to sit for hours while drinking hot coffee and tea, and watch pods of dolphins, flocks of gulls, and rainbows. It was incredible. Be very careful—this ‘loveseat’ is literally on the edge of a cliff that is about 300ft high, there are no safety rails or anything like that. Falling here would be quite easy so use your judgement. The little town of Quin sprang up around the 15th century Quin Abbey site. The Abbey Tavern is a quite nice restaurant directly across the street from the abbey ruins. They have a patio for nicer days; we were there on Sunday during their on a cold Sunday in March. The place was packed for Sunday lunch, a common phenomenon in Ireland restaurants. Notable plates were the goat cheese salad and the homemade “banoffi pie” (a combination of banana and toffee, a common dessert in the area). After lunch we strolled around the abbey grounds to walk off all that good food and Guinness. This beautiful little island, north of Galway and south of Westport, is in Lough Corrib, which is dotted with many tiny islands. Inishmicatreer is one of the largest of these; it’s a couple of miles long and contains maybe a dozen homesteads and a couple of small farms. There’s nothing whatsoever to do here except take in the views of the wildlife on the lake and enjoy the peacefulness of the area, and maybe fantasize about finding a way to live in a place that is as pastorally idyllic as this. The island is accessible by way of a narrow causeway; along the way you’ll see strange and (to us) unexplained stone cairns on a few tiny islands just off of the shore, which look like they’ve been there for decades if not for centuries. The Burren Perfumery has soaps, perfumes, beeswax candles, scented candles, hand and face creams, and oils. Everything is handmade on site in small batches. They also collect plants and flowers from the Burren and process them to extract their oils and scents, then incorporate them into some of their products. There is also a tea room on site that offers organic teas and food, including scones, sandwiches, soups and more. This 18th-century guest house sits on the crossroads in the center of Birr. It is clean, quaint, comfortable. Birr is a small-ish town, with a few pubs, a hotel or two, and a handful of interesting eateries. It also has a 17th-century castle house (built on medieval ruins) that is home to the Birr Castle Science Center. Here in 1845 was built a 52-foot long telescope that was the largest in the world for 70 years. Birr became a center of engineering, astronomy, and photography. The Emmet House B&B is just a short few blocks away from the castle and its grounds. There have been a growing number of gastropubs in Ireland, places that take a love for the favorite local dishes and apply it to a fine dining experience. The result is local and seasonal fare that’s perfectly prepared, beautifully plated, delicious, and affordable. Byrne & Woods does just that – great food in a casual pub atmosphere, in an idyllic, small-town setting. Standards like fish & chips or rustic lamb stew share a menu with items like salmon with a basil cream sauce, or a slow-roasted pork belly with sage chutney and a cider jus. The menu changes regularly, and daily specials are determined by the chef and what’s fresh that day. Desserts are likewise diverse: Sticky toffee pudding (a favorite throughout Ireland) or apple and pear compote with a blackberry and vanilla panna cotta. Byrne and Woods has a good wine list, and they also serve local craft ales – a newer trend in some pubs to compliment the ubiquitous Guinness and Bulmers draft levers. Off of the R161 northeast of the historic town of Trim, this 12th century abbey has many parts reasonably intact, including a bit of statuary and several arches. When we visited, it was a cold and foggy morning, and in that setting we’ve never been more afraid of ghosts (except perhaps when we were in Wicklow Head lighthouse.) The deep fog, frigid air, looming ravens and complete silence here just made our hair stand on end; Zen nearly had a heart attack when a jackrabbit bolted past from out of nowhere. The site is in the middle of a large field, and now there is a car park nearby with a walkway for relatively easy access. Fans of Mel Gibson (his movies, not his politics) will perhaps recognize the setting, as it was a shooting location for Braveheart (as was nearby Trim Castle.) The ruins are unattended, so be careful walking on the various rocky walls and steps. The oldest working wool mill in Ireland. Some of the items on offer here are gloves, hats, scarves, blankets, sweaters and coats, skirts and pants. The store has two floors; there are extensive items on offer to choose from, plus a tea room as well which makes a nice visit. There is a distinct style in some of the items that is really beautiful, (you can see this in the blanket and scarf pictured to the left). The items are on the pricey side, but we can attest that they last forever, and even though the blankets feel thin and light, they are very warm in the winter. You can find Avoca items all over Ireland for sale, but it’s nice to buy them right where they are made, and the best selection (and sale items too) will be found here. A good stop before or after is nearby Fitzgerald’s Pub. The Barbican is a fully renovated watchtower, which used to function as the gate to the Castle at Glenarm. The Castle is still in use by the Lord and Lady Dunluce, and though visits to the Castle are not possible, there are extensive walking paths on the grounds that are open to Barbican residents. The property has three floors, each connected by a circular stone stairway. The bedroom and bathroom are on the second floor, connected by a short staircase. It’s worth knowing that there is no shower, only a tub, but a pitcher is provided so you can rinse off. That small inconvenience is really the only (tiny) negative thing about this property — it’s important to remember that it’s incredible to stay in an ancient building like this, so they don’t always have every amenity of a modern hotel. This property is stunning, very memorable, and we highly recommend it. The Parson’s Nose is well known in Hillsborough and all over Northern Ireland as an excellent gastro-pub. The menu changes daily and uses locally sourced, seasonal ingredients. Located in an 18thC Georgian townhouse, the pub is cozy and charming, with open fires in one dining room and views over Hillsborough Castle’s lake in another. We ate here on two different nights. The first night we ordered several starters, which gave us a chance to try a variety of dishes, like the gin-cured salmon with local beets and lime creme fraiche, and the crispy hen egg with local asparagus and pea shoots. Another night we each ordered a main. One was a fantastic burger made with beef from a local farm, the other a chicken and mushroom pie in the flakiest, most buttery crust, perched in the most delicious mushroom sauce. Everything is made in-house, with the utmost care. While the food is excellent, it’s matched by the care and thought put into offering great local beers. The service here was very friendly and knowledgeable, and it was obvious that they took great pride in the food and the pub itself. This is a very popular pub, so reservations are definitely necessary. This pub is well worth a long drive. If you can, stay in Hillsborough so you can eat her a few times. At the edge of this not-very-imaginatively named but cute village of Greyabbey is the Grey Abbey site, the remains of another 12th-century Cistercian abbey. It was founded by the wife of John de Courcy, and it’s the only Cistercian abbey in Ireland to have been founded by a woman. This is one of the largest of such sites, and though it is in ruins many of its features remain intact. It is thought to be the first Gothic architecture in Ireland, as evidenced by its pointed window arches and other architectural details. The site is extensively signposted, offering a great deal of information about the buildings and the medieval monastic culture therein, bringing the ancient stone ruins to life. Although Grey Abbey evaded destruction during the 16th century “dissolution”, it was destroyed a few decades later to prevent its use by English settlers. It was later restored by the Scots in the 17th century, but it fell into disuse and disrepair again a couple of centuries later. Inland, north of Lough Neagh, is this great find: A beautiful farm shop selling their own products and many locally produced goods – from meat, eggs, and produce to baked goods, jams, and even local beer. It has a small coffee shop next door that makes lovely lunch plates with the farm goods. This is a great place to stock up on groceries on the way to a self-catering lodging – a huge box of food for several days’ worth of meals (including beer, apple juice, sausages, cheese, eggs, and snacks of all kinds) was around £44. Even considering the pound-vs-dollar exchange rate, it was a bargain, and a bonus to know that the food was all local and of such high quality and freshness. This is the way to eat in Ireland – supporting local farmers, and getting the best that this agrarian land has to offer. A feature of great interest here is outside next to the shop’s parking lot: A small pasture that an assortment of chickens shares with two huge llamas. When we were there, for some reason one of the llamas decided to chase the chickens around, prancing and stamping his hooves. The chickens were forced to scatter wildly to avoid being trampled. We wondered if this was a primitive form of chicken processing; but in the end none of the chickens were harmed, except perhaps psychologically. 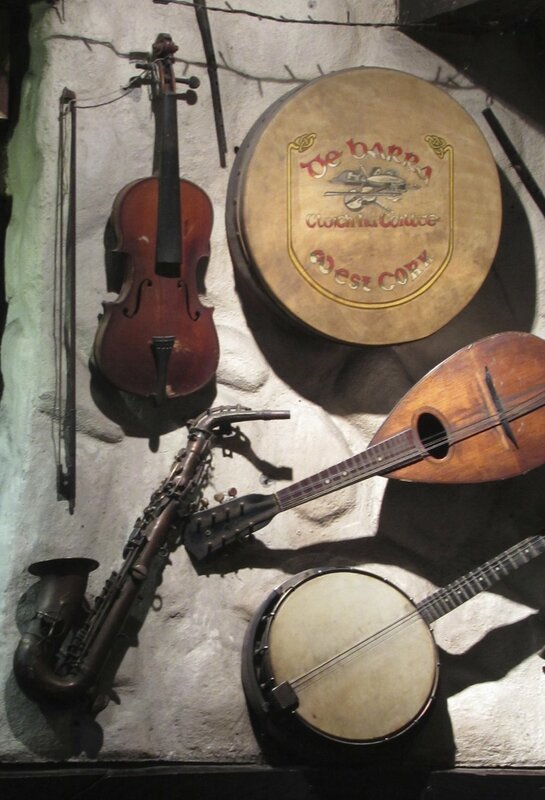 A locally legendary pub, DeBarra’s is one of the premier music venues in the West Cork area. Memorabilia on several walls remember Noel Redding, Jimi Hendrix’s original bass player, who lived and played here for the last quarter-century of his life. DeBarra’s has a dark, clubby atmosphere, with these various bits of memorabilia on every wall. Our pints were good – in this part of Ireland, ask for Murphy’s, not Guinness – and we got a great home-made fish and chips. They will run out of certain dishes, they make their stuff fresh each day; after we ordered our fish and chips, they erased that item from the menu. Clonakilty has many pubs that we didn’t have a chance to visit; but a place like DeBarra’s is one of a kind. Founded in 1240 AD and built on a 6th century monastic settlement, Timoleague Friary sits at the edge of a small bay town by the same name. This is one of those great finds, an extensive set of buildings (including wall, church rooms, cemetery, tower, some of which were added a century or so later) that visitors are free to wander at will. When we visited, a light rain was on us that created an eerie mood – understandable when surrounded by ancient walls and grave-markers. One of the most-visited sights in all of Ireland, the Cliffs of Moher stretch over five miles of coast and rise some 700 feet above the rocky sea edge. The views are staggering, and in this case the word is meant quite literally: Strong winds will push you, and those who suffer from any sort of vertigo would do well to keep one hand always on the railings. The place is set up to handle thousands of visitors daily, so be prepared to fight the crowds. We visited in March, in the late afternoon, to see the sunset. There were large crowds, including many noisy students; for us, that really detracts from the natural splendor and beauty of the place. (We can only imagine what it would be like in high summer.) Therefore, we recommend the following method of seeing this natural wonder in the following difficult but tremendously rewarding way: Stay somewhere nearby (like Doolin, the closest town of substantial size), and get up about an hour before sunrise one morning. This can be challenging depending on the number of pints consumed the night before. Drive to the Cliffs and park in the big lot – it will be open and free at that hour. Chances are you’ll be all alone there, or nearly so; and you can enjoy the views unmolested. In March it was quite cold at this point, but any amount of hardship was worth it to us for this experience. We were there for an hour, entirely alone, and got to see this sunrise all to ourselves before returning to our B&B, having a quick pot of tea, and going back to bed for another hour or so. Within sight of the historic Duncannon Fort, and just a few steps from the mile-long beach, is this bright orange tavern, an establishment that dates back to the early 1800s. Everything here is hand-made in-house (except the pasta, the barman hastens to qualify), and they serve a variety of local craft brews as well as the usual suspects. The food is traditional, fresh, delicious. As this is a fishing village, their seafood chowder is a must: In a week of excellent chowders at pubs throughout Ireland, this was one of our favorites. Burgers are made with quality Irish beef; the traditional Irish brown bread is warm right from the oven. A great food experience in a charming old pub atmosphere. After lunch, you can drive on to Duncannon Beach — inexplicably, the town lets cars literally drive on the sand. One of the best pub lunches we’ve eaten in Ireland is at this 19th-century eatery in the historical center of the coastal town Dungarvan. A hand-written chalkboard (always a good sign) displays each days’s specials, all freshly made and beautifully prepared. Fish and chips, local pork ribs, fish chowder (of course! ), and other traditional dishes are served with flair and pride. The bar interior is beautifully designed but very comfortable, taking patrons back to the heyday of the establishment’s 1868 founding. An extensive wine list, Irish whiskey shelf, and local craft brew selection combines with the fine food to create a perfect dining experience for all palates.